Although the Grand Canyon in Arizona is the best known canyon in the world, it's Bryce Canyon in Utah that has some of the most striking rock formations in the United States. While hoodoos can be found on every continent, no other rock spires truly compare to the size, scope, and color of Bryce Canyon. The spires take on a grand shape and scale at the Bryce Amphitheater, which is the most visited section of the park. It's one of a series of breaks eroded into the eastern slope of the Paunsaugunt Plateau, a major plateau that rises to an elevation of 7,000 to 9,300 feet in southwestern Utah. The plateau was created 10-20 million years ago by an uplift on the larger Colorado Plateau. After the uplift, erosion carved soft rock areas away and left harder areas that have since been whittled down by wind, rain and snow. The most durable hoodoos are capped with a magnesium-rich limestone that dissolves at a slower rate and protects the softer limestone underneath. Four vista points to take in the dramatic beauty of earth art. There are more than 13 different viewpoints within Bryce Canyon, with all of them accessible from spur roads that run between the cliffs and Highway 63, which runs parallel to the cliffs. The four best vantage points include Sunrise, Sunset, Inspiration, and Bryce Point. The first two, Sunrise and Sunset, were named after the two best times to take photographs. At these two times of day, the park features explode and the colors become even more pronounced. Almost all of the most famous photos taken in the park were taken at these two times, one of the reasons that day trips to the park never truly capture the magnitude of the canyon. Each of these two viewpoints are best known for their immediate rock formations, with Sunrise Point capturing the towering Boat Mesa and Sunset Point including Thor's Hammer, a formation that resides just below the overlook on the northern edge. Conversely, Bryce Point is probably the best place to take in the entire amphitheater and Inspiration Point offers several varied perspectives. All of them highlight the lower pink formations that are made up of sand, silt, and iron and the upper white members are a purer limestone. On a clear day from the bristlecone pine-dotted plateau, it's easy to see more than 100 miles beyond the amphitheater and into the lowlands beyond. 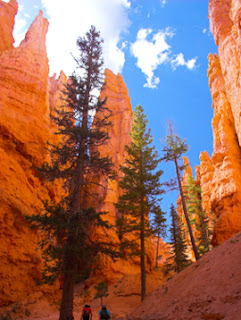 Things to do in and around Bryce Canyon. After taking in the amphitheater from various vistas, hiking is one of the most common activities. There are more than 50 miles of trails and hiking paths, including the the Rim Trail, which follows the edge of the amphitheater for approximately 5.5 miles. Other trails give visitors the opportunity to descend into into the amphitheater, ranging from the the Queens Garden Trail at Sunrise Point (a 320-foot decent) to the Navajo Loop Trail that passes through the narrow slot of "Wall Street" and a closer look at Thor's Hammer (a 580-foot decent). There are many other trails, with Swamp Canyon being one of the least traveled but most interesting as it is bounded on two sides by "fin" formations and gravity-defying hoodoos. Because it connects to the Under-The-Rim Trail, hikers can follow a loop and return to the Rim Trail rather than backtracking. In addition to hiking, Bryce Canyon hosts various events throughout the year. They include guided tours to prairie dog colonies, astronomy events, moonlit night tours, ranger programs and area horseback riding. In the winter, there are even snowshoe hikes that take visitors out in the solitude. Although not included in the review, non-campers might consider staying at the Bryce Canyon Lodge, which is a National Landmark that was built throughout the 1920s. It is the last of the original lodges designed by Gilbert Stanley Underwood. All of the lodges, hotels, and motels in the area are outside the park. While they aren't lavish enough to earn 4- or 5-star ratings, the staff make up for it. Reserve a cabin or the second floor as space is available. Bryce Canyon Breaks The Landscape At 9.7 On The Liquid Hip Richter Scale. Bryce Canyon is open 24 hours a day, with the visitor center open from 8 a.m. to 8 p.m. between May and September. Hours vary between October and April. The visitor center includes a small museum with geology, wildlife, star gazing, and history. Wildlife abounds in the park, ranging from chipmunks to mule dear. The park itself is ideal for art and photography. Summers tend to be more crowded. For a complete overview of travel accommodations in and around Bryce Canyon or Zion National Park, compare top travel deals at Expedia.com. 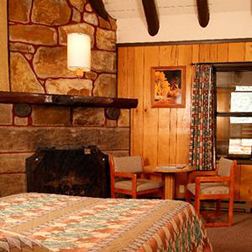 For more information about the Lodge Bryce Canyon, you can also visit the site. The best part about staying overnight is that the park is one of only three International Dark Skies parks in the United States.